Hill-Kimberley — + online . Making it personal at Nordia Included in the array of communications products we've been developing for Nordia since 2013 was a complete re-design of their recruitment-friendly website. We believed in their credo "We make it personal" and delivered English and French websites that reflect their impressive company spirit in an easy user experience. Nordia employees are featured throughout and each location has a designated page to promote their environment, perks, training sessions, etc. 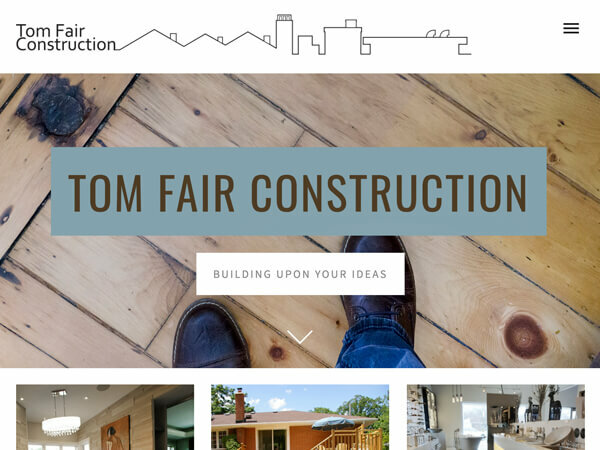 Bringing renovation ideas to life Tom Fair Construction's attention to collaboration, managing expectations and quality work are what peaked our interest from the start. The 3-generation, family-owned business enjoyed a solid reputation through word-of-mouth, but their existing website was letting them down. We helped them tell their story with clearer, more focused content and a simpler layout so their projects could sing! Be part of the music It was important for new choir-kid-in-town Chorale Musaïque to reflect the diversity of its members, in song and in how they wanted to brand themselves. We designed a brand identity that was as lyrical and fluid as they were: the hand-scripted typeface felt human, natural and timeless from the get-go; but it was the colourful mosaic application we introduced – and its limitless possibilities – that won them over. How we think about health Equipped with the well-received brand identity we developed for Keystone Health, we extended what we learned about their healthcare approach to their online presence. Our recommendations for visuals, content and functionality were a hit, especially the online appointment system that Keystone staff and patients could work wonders with. Algario extends their rebrand Learning Development provider Algario was going in a new direction communications-wise. Our re-design of their print, communications and presentation products had been very successful for them – they knew they had to step up their game online to stay consistent. We re-designed their website with focused content, a more effective navigation system and kicky graphics to help communicate their messaging with impact. Paying homage A Brittany family's personal collection of historical information, resources and photos of one of the most dynamic fighter planes from WWII, the Vought F4U Corsair. The International Centre for Human Rights Education brings on their 2.0 website Equitas' fresh, new approach to their brand was already underway for their Marketing and Communications print collateral, but their website was a problem. The old format wasn't cutting it anymore visually and in terms of functionality and we wanted to help Equitas fast track their vision. Enter 2.0. Equitas was very pleased with how we increased their online brand appeal and especially with the marked difference the new site was making in how they communicated their message. Tempered tough MD Glass knew they had a great product in the quality tempered glass they’d been producing for over two decades. While they were known locally, they realized having a solid online presence could help them expand their reach in a big way. The website we developed – from branding to content development to design – exceeded their expectations. Sharing expertise Montreal-based design firm Nolin had designed Alcan's print Annual Report for 2002 and was looking for collaboration partners to develop an online version. We teamed up and designed a successful interactive product that respected the look and feel Nolin had established in print while providing an evolved audience experience with the latest in web functionality.